Admire your space with most beautiful handmade silk area rug which is made in pure silk material. Silk rug is known for its complicated and "One of a kind" design pattern and smooth touch. 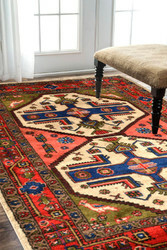 Give a smooth and royal look to your decor by placing a magnificent Kashmiri silk carpet online from Rugs and Beyond.